In Between Revolutions, Michener Award–winning author Laurie Alberts relives her experiences teaching in Moscow and Leningrad as a participant in an American Field Service exchange program before the fall of the Soviet Union. Her memoir provides a unique glimpse into the lives of ordinary Russians during the last years of the Soviet empire, while also portraying the difficulties of American/Soviet relations on the most personal of levels—the ways in which Cold War politics warped human connections. 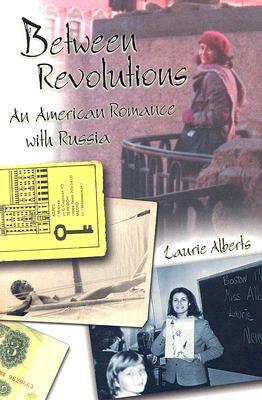 Alberts begins her tale in 1982 with her arrival in Moscow and describes her interactions with the students and her complicated friendships with some of the teachers. Her novelty as an American allows her to be privy to the intrigues, romances, and humor through which these Russians coped with their difficult, frustrating lives. The isolation of her experience and her romantic notions of Russia, as well as her need to belong, lead her to make choices that are not always the best. When she moves to Leningrad, Alberts unwittingly develops her own intrigue by beginning an affair with a charming but somewhat shady Russian named Kolya. Her tryst with Kolya mirrors her lifelong fascination with Russia, a place that, despite her efforts, she will never quite understand. After leaving Leningrad for six months, she returns to find that the political turmoil of the country has altered her connection to Kolya irreparably. Alberts’s story ends in 2002, when a return visit to Russia—and Kolya— reveals the drastic changes brought by the fall of Communism to the lives of her friends and to their nation. Laurie Alberts teaches fiction and creative nonfiction in the Vermont College MFA and Writing Program. She is the author of five other books, including Fault Line and Tempting Fate.